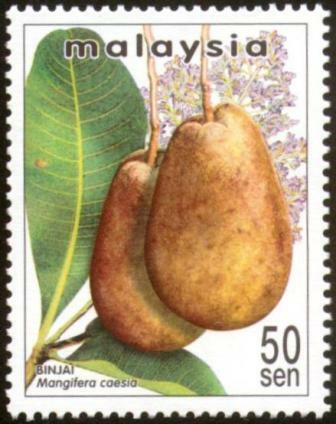 Other names: Belunu, malaysian mango. Binjai is a fruit of South East Asia. It is naturally distributed in Sumatra, Borneo and Peninsular Malaysia. It is cultivated in Bali, Peninsular Thailand and, rarely, to western Java. 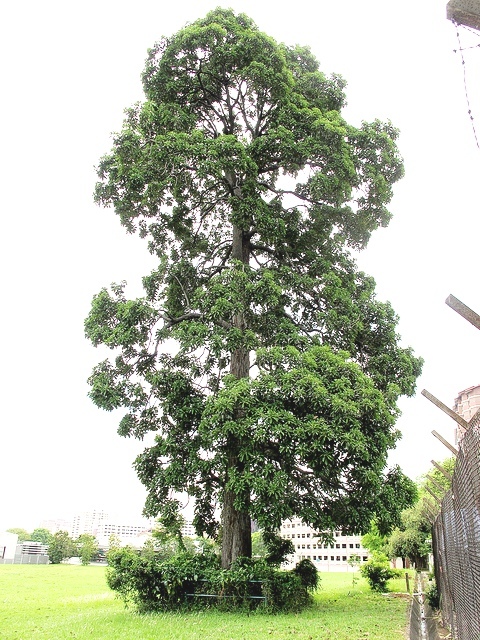 A large evergreen tree, upto 30 m tall, and bole 50-80(-120) cm or more in diameter, crown dome-shaped with massive branches; bark greyish-brown, superficially fissured, containing irritant sap. Leaves elliptic to lanceolate, more or less obovate, (7-)10-12(-30) cm x (3-)4-5.5(-10) cm, medium green and shiny above, paler below, often crowded at the end of stout branchlets, coriaceous, blunt or bluntly acuminate; midrib thick, flattened, raised above, base gradually decurrent; petiole stout, flattened, 1-1.5(-2.5) cm long. 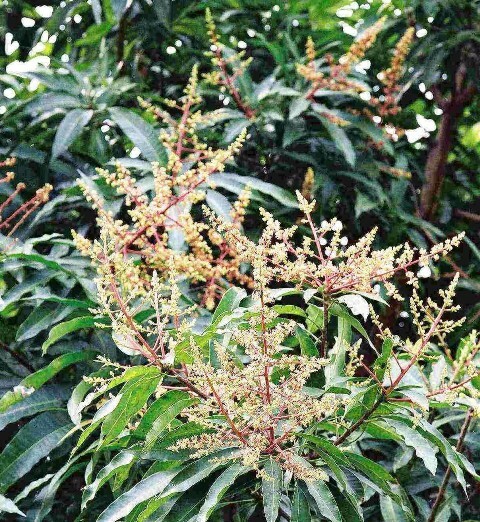 Panicle terminal, 15-25(-40) cm long, much branched with stout rachis and branches, densely flowered, pale pink; flowers 5-merous, pale lilac, fragrant; petals linear, up to 10 mm long, not strongly reflexed as in most other mango flowers, only slightly reflexed in the upper part; fertile stamen 1, filament 5 mm long, white at base, purple towards the apex, 4 teeth-like staminodes; disc narrow, stipe-like, 1-1.5 mm long, pale green; ovary obliquely globose, reddish brown, style excentric, 8 mm long, white, becoming violet after anthesis. Fruit an obovate-oblong drupe, necked at base, 12-15(-20) cm x 6-7(-12) cm; skin yellowish or pale brownish, very thin (1 mm); pulp whitish, soft and juicy, fibrous, with a peculiar sourish taste and strong smell at maturity. The ‘wani’ form: fruit ellipsoid, rounded, 9-11 cm x 6.5-7 cm, glossy pale green at maturity, flesh milky white; the best forms are almost fibreless with a sweet pleasant taste. Seed (stone) ellipsoid-lanceolate, ca. 7 cm x 3.5-4 cm, not flattened, thin-walled, endocarp not woody, made of matted coarse fibres, monoembryonic. Wild forms have sour fruits but there is a cultivar in Borneo and Bali with sweet, fibreless and tasty fruits. The smell of the fruit pulp is rather offensive, and the white juice of the immature fruit is very irritating to the skin and when ingested. 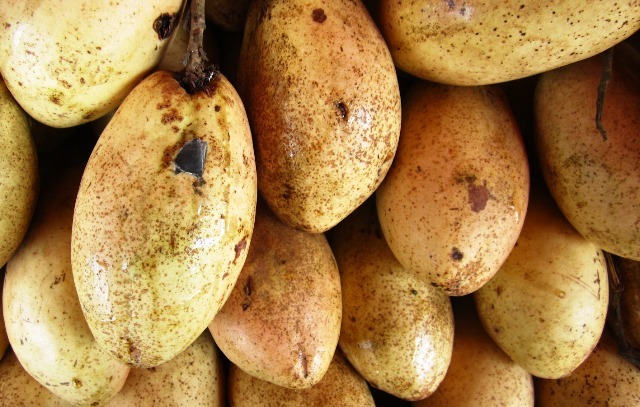 Binjai fruits are juicy and sweetish-sour and are eaten fresh by local people. Binjai is often used to prepare a spice based on chillies (sambal) which is eaten with river fish. In some areas, the flesh of ripe fruit is pickled and preserved with salt in jars. This is used to make sambal when fresh fruits are not available. Nutritive value: About 65% of the binjai fruit is edible. Per 100 g edible portion the constituents are: water 86.5 g, protein 1 g, fat 0.2 g, carbohydrates including fibre 11.9 g, ash 0.4 g, thiamine 0.08 mg, beta-carotene equivalent 0.005 mg and vitamin C 58 mg. The energy value is 200 kJ/100 g.
Binjai is propagated from seed only. Grafting by inarching might be feasible. 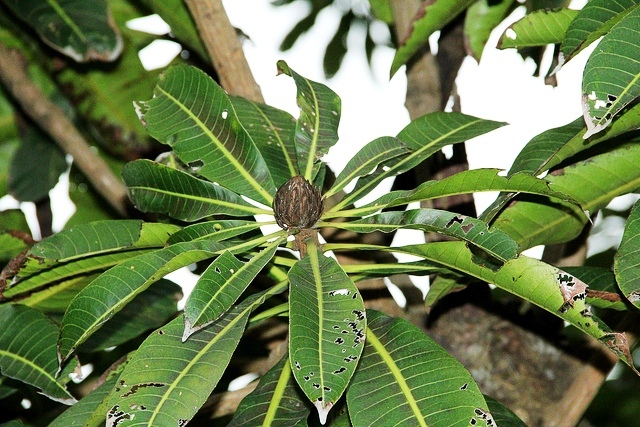 However, it has not succeeded on mango seedlings. Binjai grows well upto an elevation of 400 m. It seems to require rainfall almost through out the year. Bijai is a very heavy bearer and a single tree can produce thousands of fruits. The fruit ripens 3 months after anthesis. A planting distance of 12-16 seems to be the most optimum. There is a variety or form called wani which is mainly found in Bali and East Kalimantan. Wani fruits are more juice, sweeter and nearly fibreless. It also lacks the characteristic binjai smell which some people find offensive. This variety is therefore liked more by the consumers and fetches a higher price in markets.